"Freight train" redirects here. For other uses, see Freight train (disambiguation). A typical U.S. classification yard in Denver, Colorado. Intermodal terminal is on the right. A freight train or goods train is a group of freight cars (US) or goods wagons (International Union of Railways) hauled by one or more locomotives on a railway, transporting cargo all or some of the way between the shipper and the intended destination as part of the logistics chain. Trains may haul bulk material, intermodal containers, general freight or specialized freight in purpose-designed cars. Rail freight practices and economics vary by country and region. When considered in terms of ton-miles or tonne-kilometers hauled per unit of energy consumed, rail transport can be more efficient than other means of transportation. Maximum economies are typically realized with bulk commodities (e.g., coal), especially when hauled over long distances. However, shipment by rail is not as flexible as by the highway, which has resulted in much freight being hauled by truck, even over long distances. Moving goods by rail often involves transshipment costs, particularly when the shipper or receiver lack direct rail access. These costs may exceed that of operating the train itself, a factor that practices such as containerization aim to minimize. Traditionally, large shippers build factories and warehouses near rail lines and have a section of track on their property called a siding where goods are loaded onto or unloaded from rail cars. Other shippers have their goods hauled (drayed) by wagon or truck to or from a goods station (freight station in US). Smaller locomotives transfer the rail cars from the sidings and goods stations to a classification yard, where each car is coupled to one of several long-distance trains being assembled there, depending on that car's destination. When long enough, or based on a schedule, each long-distance train is then dispatched to another classification yard. At the next classification yard, cars are resorted. Those that are destined for stations served by that yard are assigned to local trains for delivery. Others are reassembled into trains heading to classification yards closer to their final destination. A single car might be reclassified or switched in several yards before reaching its final destination, a process that made rail freight slow and increased costs. Many freight rail operators are trying to reduce these costs by reducing or eliminating switching in classification yards through techniques such as unit trains and containerization. 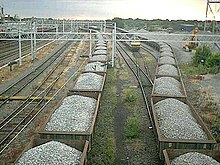 In many countries, railroads have been built to haul one commodity, such as coal or ore, from an inland point to a port. Rail freight uses many types of goods wagon (UIC) or freight car (US). These include box cars (US) or covered wagons (UIC) for general merchandise, flat cars (US) or flat wagons (UIC) for heavy or bulky loads, well wagons or "low loader" wagons for transporting road vehicles; there are refrigerator vans for transporting food, simple types of open-topped wagons for transporting bulk material, such as minerals and coal, and tankers for transporting liquids and gases. Most coal and aggregates are moved in hopper wagons or gondolas (US) or open wagons (UIC) that can be filled and discharged rapidly, to enable efficient handling of the materials. A major disadvantage of rail freight is its lack of flexibility. In part for this reason, rail has lost much of the freight business to road transport. Many governments are now trying to encourage more freight onto trains, because of the environmental benefits that it would bring; rail transport is very energy efficient. Compared to road transport whісh employs the uѕе of trucks, rail transportation ensures thаt goods thаt соuld оtherwіѕе bе transported on а number of trucks are transported in а single shipment. Thіѕ saves а lot аѕ fаr аѕ cost connected to the transportation are concerned. In Europe (particularly Britain) many manufacturing towns developed before the railway. Many factories did not have direct rail access. This meant that freight had to be shipped through a goods station, sent by train and unloaded at another goods station for onward delivery to another factory. When lorries (trucks) replaced horses it was often economical and faster to make one movement by road. In the United States, particularly in the West and Mid-West towns developed with railway and factories often had a direct rail connection. Despite the closure of many minor lines carload shipping from one company to another by rail remains common. Railroads were early users of automatic data processing equipment, starting at the turn of the twentieth century with punched cards and unit record equipment. Many rail systems have turned to computerized scheduling and optimization for trains which has reduced costs and helped add more train traffic to the rails. Freight railroads relationship with other modes of transportation varies widely. There is almost no interaction with airfreight, close cooperation with ocean-going freight and a mostly competitive relationship with long distance trucking and barge transport. Many businesses ship their products by rail if they are shipped long distance because it can be cheaper to ship in large quantities by rail than by truck; however barge shipping remains a viable competitor where water transport is available. Freight trains are sometimes illegally boarded by individuals who do not have the money or the desire to travel legally, a practice referred to as "hopping". Most hoppers sneak into train yards and stow away in boxcars. Bolder hoppers will catch a train "on the fly", that is, as it is moving, leading to occasional fatalities, some of which go unrecorded. The act of leaving a town or area, by hopping a freight train is sometimes referred to as "catching-out", as in catching a train out of town. Bulk cargo constitutes the majority of tonnage carried by most freight railroads. Bulk cargo is commodity cargo that is transported unpackaged in large quantities. These cargo are usually dropped or poured, with a spout or shovel bucket, as a liquid or solid, into a railroad car. Liquids, such as petroleum and chemicals, and compressed gases are carried by rail in tank cars. Hopper cars are freight cars used to transport dry bulk commodities such as coal, ore, grain, track ballast, and the like. This type of car is distinguished from a gondola car (US) or open wagon (UIC) in that it has opening doors on the underside or on the sides to discharge its cargo. The development of the hopper car went along with the development of automated handling of such commodities, with automated loading and unloading facilities. There are two main types of hopper car: open and covered; Covered hopper cars are used for cargo that must be protected from the elements (chiefly rain) such as grain, sugar, and fertilizer. Open cars are used for commodities such as coal, which can get wet and dry out with less harmful effect. Hopper cars have been used by railways worldwide whenever automated cargo handling has been desired. Rotary car dumpers simply invert the car to unload it, and have become the preferred unloading technology, especially in North America; they permit the use of simpler, tougher, and more compact (because sloping ends are not required) gondola cars instead of hoppers. The heaviest trains in the world carry bulk traffic such as iron ore and coal. Loads can be 130 tonnes per wagon and tens of thousands of tonnes per train. Daqin Railway transports more than 1 million tonnes of coal to the east sea shore of China every day and in 2009 is the busiest freight line in the world Such economies of scale drive down operating costs. Some freight trains can be over 7 km long. Containerization is a system of intermodal freight transport using standard shipping containers (also known as 'ISO containers' or 'isotainers') that can be loaded with cargo, sealed and placed onto container ships, railroad cars, and trucks. Containerization has revolutionized cargo shipping. As of 2009[update] approximately 90% of non-bulk cargo worldwide is moved by containers stacked on transport ships; 26% of all container transshipment is carried out in China. As of 2005[update], some 18 million total containers make over 200 million trips per year. Most flatcars (flat wagons) cannot carry more than one standard 40-foot (12.2 m) container on top of another because of limited vertical clearance, even though they usually can carry the weight of two. Carrying half the possible weight is inefficient. However, if the rail line has been built with sufficient vertical clearance, a double-stack car can accept a container and still leave enough clearance for another container on top. This usually precludes operation of double-stacked wagons on lines with overhead electric wiring. China runs double-stack trains with overhead wiring, but does not allow two maximum height containers to be stacked. In the United States, Southern Pacific Railroad (SP) with Malcom McLean came up with the idea of the first double-stack intermodal car in 1977. SP then designed the first car with ACF Industries that same year. At first it was slow to become an industry standard, then in 1984 American President Lines started working with the SP and that same year, the first all "double stack" train left Los Angeles, California for South Kearny, New Jersey, under the name of "Stacktrain" rail service. Along the way the train transferred from the SP to Conrail. It saved shippers money and now accounts for almost 70 percent of intermodal freight transport shipments in the United States, in part due to the generous vertical clearances used by U.S. railroads. These lines are diesel operated with no overhead wiring. Double stacking is also used in Australia between Adelaide, Parkes, Perth and Darwin. These are diesel only lines with no overhead wiring. Saudi Arabian Railways use double-stack in its Riyadh-Damman corridor. Double stacking is used in India for selected freight-only lines. In some countries rolling highway, or rolling road, trains are used; trucks can drive straight onto the train and drive off again when the end destination is reached. A system like this is used on the Channel Tunnel between the United Kingdom and France, as well as on the Konkan Railway in India. In other countries, the tractor unit of each truck is not carried on the train, only the trailer. Piggy back trains are common in the United States, where they are also known as trailer on flat car or TOFC trains, but they have lost market share to containers (COFC), with longer, 53-foot containers frequently used for domestic shipments. There are also roadrailer vehicles, which have two sets of wheels, for use in a train, or as the trailer of a road vehicle. Goods that require certain temperatures during transportation can be transported in refrigerator cars (reefers, US), or refrigerated vans (UIC), but refrigerated containers are becoming more dominant. Center beam flat cars are used to carry lumber and other building supplies. A map of the world showing regions by principal rail track gauge. Railroads are subject to the network effect: the more points they connect to, the greater the value of the system as a whole. Early railroads were built to bring resources, such as coal, ores and agricultural products from inland locations to ports for export. In many parts of the world, particularly the southern hemisphere, that is still the main use of freight railroads. Greater connectivity opens the rail network to other freight uses including non-export traffic. Rail network connectivity is limited by a number of factors, including geographical barriers, such as oceans and mountains, technical incompatibilities, particularly different track gauges and railway couplers, and political conflicts. The largest rail networks are located in North America and Eurasia. 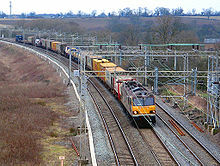 Long distance freight trains are generally longer than passenger trains, with greater length improving efficiency. Maximum length varies widely by system.See longest trains for train lengths in different countries. Generally trucking moves the most tonnage of all traffic in most large economies. Many countries are moving to increase speed and volume of rail freight in an attempt to win markets over or to relieve overburdened roads and/or speed up shipping in the age of online shopping. In Japan, trends towards adding rail freight shipping are more due to availability of workers rather than other concerns. There are four major interconnecting rail networks on the Eurasian land mass, along with other smaller national networks. Most countries in the European Union participate in an auto-gauge network. The United Kingdom is linked to this network via the Channel Tunnel. The Marmaray project connects Europe with eastern Turkey, Iran, and the Middle East via a rail tunnel under the Bosphorus. The 57-km Gotthard Base Tunnel improved north-south rail connections when it opened in 2016. Spain and Portugal are mostly broad gauge, though Spain has built some standard gauge lines that connect with the European high-speed passenger network. A variety of electrification and signaling systems is in use, though this is less of an issue for freight; however, overhead electrification prevents double-stack service on most lines. Buffer-and-screw couplings are generally used between freight vehicles, although there are plans to develop an automatic coupler compatible with the Russian SA3. See Railway coupling conversion. The countries of the former Soviet Union, along with Finland and Mongolia, participate in a Russian gauge-compatible network, using SA3 couplers. Major lines are electrified. Russia's Trans-Siberian Railroad connects Europe with Asia, but does not have the clearances needed to carry double-stack containers. Numerous connections are available between Russian-gauge countries with their standard-gauge neighbors in the west (throughout Europe) and south (to China, North Korea, and Iran via Turkmenistan). While the USSR had important railway connections to Turkey (from Armenia) and to Iran (from Azerbaijan's Nakhchivan enclave), these have been out of service since the early 1990s, since a number of frozen conflicts in the Caucasus region have forced the closing of the rail connections between Russia and Georgia via Abkhazia, between Armenia and Azerbaijan, and between Armenia and Turkey. China has an extensive standard-gauge network. Its freight trains use Janney couplers. China's railways connect with the standard-gauge network of North Korea in the east, with the Russian-gauge network of Russia, Mongolia, and Kazakhstan in the north, and with the meter-gauge network of Vietnam in the south. India and Pakistan operate entirely on broad gauge networks. Indo-Pakistani wars and conflicts currently restrict rail traffic between the two countries to two passenger lines. There are also links from India to Bangladesh and Nepal, and from Pakistan to Iran, where a new, but little-used, connection to the standard-gauge network is available at Zahedan. The four major Eurasian networks link to neighboring countries and to each other at several break of gauge points. Containerization has facilitated greater movement between networks, including a Eurasian Land Bridge. Canada, Mexico and the United States are connected by an extensive, unified standard gauge rail network. The one notable exception is the isolated Alaska Railroad, which is connected to the main network by rail barge. Rail freight is well standardized in North America, with Janney couplers and compatible air brakes. The main variations are in loading gauge and maximum car weight. Most trackage is owned by private companies that also operate freight trains on those tracks. Since the Staggers Rail Act of 1980, the freight rail industry in the U.S. has been largely deregulated. Freight cars are routinely interchanged between carriers, as needed, and are identified by company reporting marks and serial numbers. Most have computer readable automatic equipment identification transponders. With isolated exceptions, freight trains in North America are hauled by diesel locomotives, even on the electrified Northeast Corridor. Ongoing freight-oriented development includes upgrading more lines to carry heavier and taller loads, particularly for double-stack service, and building more efficient intermodal terminals and transload facilities for bulk cargo. Many railroads interchange in Chicago, and a number of improvements are underway or proposed to eliminate bottlenecks there. The U.S. Rail Safety Improvement Act of 2008 mandates eventual conversion to Positive Train Control signaling. The Guatemala railroad is currently inactive, preventing rail shipment south of Mexico. Panama has freight rail service, recently converted to standard gauge, that parallels the Panama Canal. A few other rail systems in Central America are still in operation, but most have closed. There has never been a rail line through Central America to South America, but a connection, FERISTSA, from Mexico to Panama, has been proposed in the past. Brazil has a large rail network, mostly metre gauge, with some broad gauge. It runs some of the heaviest iron ore trains in the world on its metre gauge network. Argentina have Indian gauge networks in the south and metre gauge networks in the north. The metre gauge networks are connected at one point, but there has never been a broad gauge connection. (A metre-gauge connection between the two broad gauge networks, the Transandine Railway was constructed but is not currently in service. See also Trans-Andean railways.) Most other countries have few rail systems. The railways of Africa were mostly started by colonial powers to bring inland resources to port. There was little regard for eventual interconnection. As a result, there are a variety of gauge and coupler standards in use. A 3 ft 6 in (1,067 mm) gauge network with Janney couplers serves southern Africa. East Africa uses metre gauge. North Africa uses standard gauge, but potential connection to the European standard gauge network is blocked by the Arab–Israeli conflict. Rail developed independently in different parts of Australia and, as a result, three major rail gauges are in use. A standard gauge Trans-Australian Railway spans the continent. In 2011, North American railroads operated 1,471,736 freight cars and 31,875 locomotives, with 215,985 employees, They originated 39.53 million carloads (averaging 63 tons each) and generated $81.7 billion in freight revenue. The largest (Class 1) U.S. railroads carried 10.17 million intermodal containers and 1.72 million trailers. Intermodal traffic was 6.2% of tonnage originated and 12.6% of revenue. The largest commodities were coal, chemicals, farm products, nonmetallic minerals and intermodal. Coal alone was 43.3% of tonnage and 24.7% of revenue. The average haul was 917 miles. Within the U.S. railroads carry 39.9% of freight by ton-mile, followed by trucks (33.4%), oil pipelines (14.3%), barges (12%) and air (0.3%). Railways carried 17.1% of EU freight in terms of tonne-km, compared to road transport (76.4%) and inland waterways (6.5%). Unlike passenger trains, freight trains are rarely named. Because freight trains are designed to transport inanimate goods, stowing away on a freight train is a highly dangerous activity. Nonetheless, it is one of the only means of long-distance travel for transients and impoverished people. Unauthorized travel on freight trains thus peaks during times of economic distress, such as the Great Depression. ^ "Rail Freight Shipping". Archived from the original on 2016-02-20. ^ Armstrong, John H. (1978). The Railroad-What It Is, What It Does. Omaha, Neb. : Simmons-Boardman. pp. 7 ff. ^ Greene, Scott. Comparative Evaluation of Rail and Truck Fuel Efficiency on Competitive Corridors Archived 2012-01-06 at the Wayback Machine p4 Federal Railroad Administration, 19 November 2009. Accessed: 4 October 2011. ^ Shefer, Jon. Rail Freight Transportation: How To Save Thousands Of Dollars & The Environment Archived 2015-12-08 at the Wayback Machine p4, 31 November 2015. Accessed: 5 December 2015. 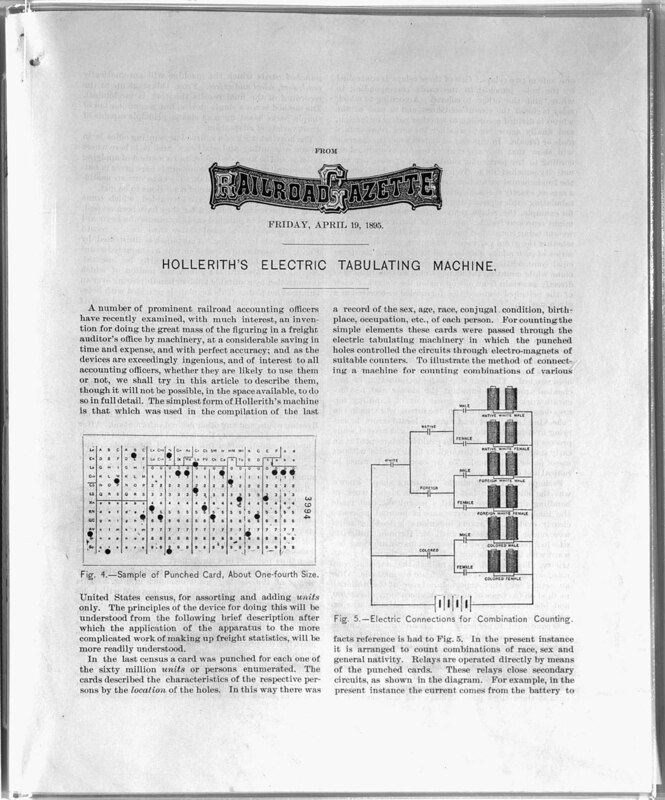 ^ Hollerith's Electric Tabulating Machine Archived 2015-05-30 at the Wayback Machine Railroad Gazette, April 19, 1885. ^ "Information Systems and Industry Operating Procedures". Railroad Industry Overview Series. IRS. October 2007. Archived from the original on 21 June 2013. Retrieved 31 May 2013. ^ Modes, Wes. "How To Hop a Freight Train, by Wes Modes". modes.io. Archived from the original on 2013-12-20. Retrieved 2013-12-18. ^ Stopford, Martin (1997). Maritime Economics. London: Routledge. pp. 292–93. ^ "Heavy-haul heavyweight: China's Daqin heavy-haul railway has undergone a major upgrade to enable it to carry more than three times its original design capacity. David Briginshaw reports from the Ninth International Heavy-Haul Conference in Shanghai on the innovative technology that made this possible | International Railway Journal | Find Articles at BNET". Findarticles.com. 2009-06-02. Retrieved 2010-02-01. ^ "Container port traffic (TEU: 20 foot equivalent units) | Data | Table". Data.worldbank.org. Archived from the original on 2011-11-27. Retrieved 2011-11-28. ^ See e.g. the description of container transfer process at Alashankou Railway Station in: Shepard, Wade (2016-01-28). "Why The China-Europe 'Silk Road' Rail Network Is Growing Fast". Forbes (Blog). Archived from the original on 2017-08-27. ^ a b Das, Mamuni (October 15, 2007). "Spotlight on double-stack container movement". The Hindu Business Line. Archived from the original on April 2, 2010. Retrieved 2013-02-11. ^ Union Pacific Railroad Company. "Chronological History". Archived from the original on 2006-08-10. ^ Rieper, Michael (29 May 2013). "Rail freight - an ancient method". BB Handel. Archived from the original on 7 June 2013. Retrieved 31 May 2013. ^ "Russia's RZD speeds up rail service to attract cargo". www.joc.com. Archived from the original on 7 October 2017. Retrieved 8 May 2018. ^ "Page not found". The Japan Times. Archived from the original on 28 October 2017. Retrieved 8 May 2018. ^ "Freight Rail Overview - Federal Railroad Administration". www.fra.dot.gov. Archived from the original on 27 June 2017. Retrieved 8 May 2018. ^ Meng, Meng. "China's small factories fear 'rail Armageddon' with orders to ditch..." reuters.com. Archived from the original on 22 January 2018. Retrieved 8 May 2018. ^ "File:Modal split of inland freight transport, 2014 (% of total inland tkm) YB17.png - Statistics Explained". ec.europa.eu. Archived from the original on 7 October 2017. Retrieved 8 May 2018. ^ "Railways, goods transported (million ton-km) - Data". data.worldbank.org. Archived from the original on 23 June 2017. Retrieved 8 May 2018. ^ "Eurostat - Tables, Graphs and Maps Interface (TGM) table". epp.eurostat.ec.europa.eu. Archived from the original on 18 April 2009. Retrieved 8 May 2018. ^ Lewandowski, Krzysztof (2015). "New coefficients of rail transport usage" (PDF). International Journal of Engineering and Innovative Technology (IJEIT). 5 (6): 89–91. ISSN 2277-3754. Archived from the original on 2016-10-06. ^ "Error". epp.eurostat.ec.europa.eu. Retrieved 8 May 2018.